A troubled sixteen year old girl moves away from home, her parents unwilling to tolerate her not complying with their devout religious beliefs as Jehovah’s Witnesses. Finally free of the strict rules and isolated lifestyle she had known her whole life, she is faced with making her own decisions and choices about her future for the first time. On the first day in town, she falls under the spell of a man ten years older and finds herself blinded by love. 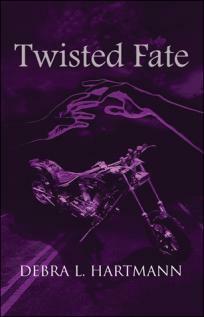 Fate is a member of a very dangerous bike club and while he gives her love and family like she has never known he confuses and entraps her with abuse and torturous experiences that she is made to believe are normal for a biker’s ole lady, as life inside a motorcycle gang is explored and exposed. Her strength carries her through the unthought-of abuses and twisted existence until a surprising ending that will shock and awe the reader while revealing the survival instincts that no woman should ever have to fall back on. This book is to be the first in a series that will continue to open the reader’s eyes to the ups and downs of the biker lifestyle, the ins and outs of loving the wrong men and the strength that all women possess to rise above anything and everything that diminishes or strips them of respect for themselves and love and happiness. Debra L Hartmann is from a small town just east of Asheville, NC called Swannanoa. The ‘natives’ refer to it as Swannanowhere and even today it has the least amount of traffic of any of the surrounding areas of Asheville and has maintained its quiet, slow country charm despite the rapid growth all around. She is a country girl at heart and though educated and with an excellent professional resume, she is much happier writing from home where she now resides miles from any city. Debra is also a motorcycle enthusiast, has been mesmerized by the biker lifestyle for as long as she can remember and got her first Harley at age 17. Her first book is based on her own life experiences from age 16 and as the book becomes a series of books, readers will learn more and more about what it’s like for a woman in an MC and later an independent in the biker community. It’s important to Debra that the general public learns how incredibly wrong they are to judge a book by its cover. ‘Bikers’ are often generally referred to as biker trash when in reality, most are no different than everyone else except in their choices of clothing, transportation and how they spend their free time. Debra was an executive level manager for two major companies, later a successful business owner and these days a successful editor and published author. On the weekends, you’ll find her snuggled up behind her wonderful husband riding the amazing curvy mountain roads surrounding Asheville NC on their old school Ironhead custom Harley. Debra also writes short stories and articles and is a big advocate for supporting new authors through her work in providing an editing service with lower pricing standards, resources on various websites and informative blog posts.